After a week during which NFL fans experienced their teams behave in a whole host of ways during the national anthem, the Denver Broncos announced on their website Thursday that they will stand as a team for the playing of the "Star-Spangled Banner" on Sunday. 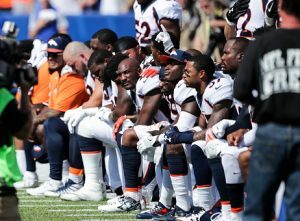 Before their last game against the Buffalo Bills, a number of Broncos players knelt during the playing of the national anthem, part of a large-scale protest after President Donald Trump said kneeling players should be fired. The Broncos acknowledged those who knelt in the announcement that the team would stand together this weekend. "Last week, members of our team joined their brothers around the NFL in a powerful display of unity," read a blog post attributed to "the Denver Broncos players." "While there's no greater country, it's not perfect," they wrote. "Inequalities still exist, and we have work to do in ALL forms of social justice. We can all do better." "We may have different values and beliefs, but there's one thing we can all agree on: We're a team and we stand together—no matter how divisive some comments and issues can be, nothing should ever get in the way of that." "Starting Sunday, we'll be standing together," the post concluded. It remains to be seen whether the Broncos will stand but still incorporate some other form of protest, such as when the Dallas Cowboys and Arizona Cardinals chose to lock arms during the anthem. The Broncos play the Oakland Raiders at home at 4:25 p.m. ET on Sunday. The Vance Joseph-coached team is 2-1, with their sole loss at Buffalo.